Friendship is a bond that is hard to break over time or even distance. Celebrate how long you have been friends with your best friend by giving them this beautifully Engraved Friendship Keepsake to your closest friends. Our elegant & clear Personalized Keepsake measures 5"x5" with edges measuring 3/4" thick featuring a silver edged timepiece with quartz movement. Engraved FREE with any Personalization! Personalize with any name and a ending sentiment with a two line custom message. 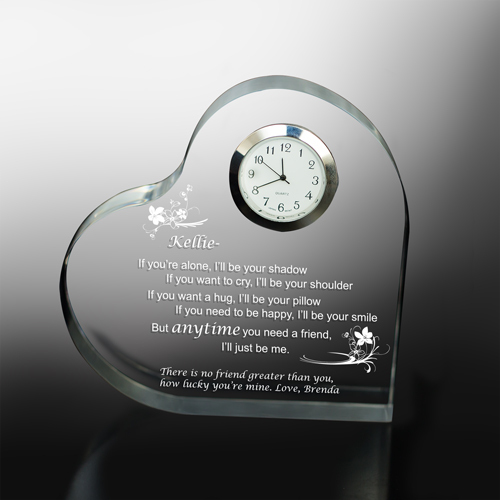 Engraved Keepsake Clocks make perfect gifts for bridesmaids, maid of honor or any friendship gift. Very happy with product and delivery! Lovely keepsake for a great friend.